Digital printing| Litho Printing| Printers| Burnley| Blackburn| Preston. Media Village offer digital and litho printing services having evolved from a commercial printing company into a full service marketing agency. Based in Accrington, and close to Burnley, Blackburn and Preston we supply all aspects of printing from one off quantities to hundreds of thousands. important part of the marketing mix? Quality printing will always have a place within a business’s armoury. The concept of the paperless office is great from an environmental point of view but from a marketing aspect it makes no sense at all. Print is essential and whilst it has slid down the pecking order of ways of promoting your business, don’t be lulled into a false sense of security that it can be dispensed with entirely. People cherish print. 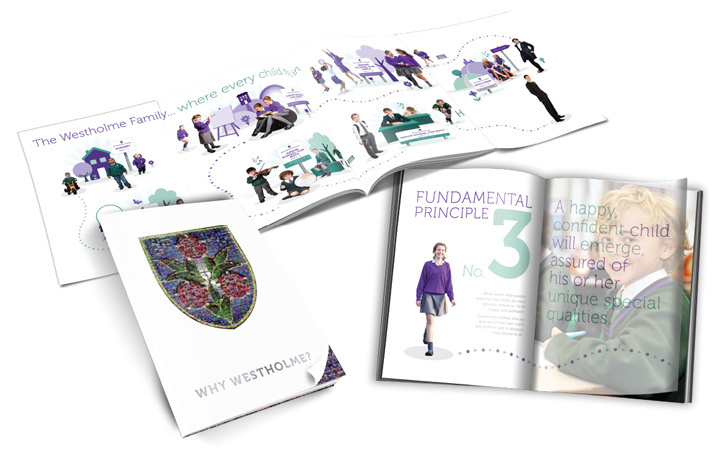 A well-designed brochure printed on a quality paper, finished well gives your customers something to hold, something to retain, admire, touch, refer to, take with them, write on, keep visible and see every day. Print lasts, print endures! Online emails and social media are OK but can quickly get forgotten amongst the myriad of messages received every day. A carefully crafted print campaign on the other hand delivered by a professional printing company, experienced in all aspects of commercial print, can demonstrate professionalism, expertise and help to attract more customers, in fact as the number of marketing channels keep increasing, print can actually have more impact, not less. When you view the printing services of a company online, the options are fairly limited. However, if you want your product to stand out you need to be aware of all of the options available, a professional commercial printer can explain these options. The weight of paper, the paper coating, the texture; the various printing options, foiling, embossing, spot UV; the various laminating options, soft touch, gloss, matt, heat to reveal, anti-scuff will all be familiar to a good printing company and ones they will be happy to advise on. For many years, print was the most significant part of any business’s marketing mix, playing its part in communicating marketing aims, promoting services and products and helping sell products. Print still has much to give, partly because it has become more of a rarity, a quality piece of professionally finished marketing material is something to cherish. And don’t forget, first impressions count. When attending networking meetings and meeting people for the first time, the first piece of marketing material you will leave with them is generally your business card. Ensuring that this leaves a good lasting impression is important and using a company who understand the importance of business card printing is essential if your business card is not to end up in a bin immediately after you have left. why you should choose the Media Village. Not only can Media Village provide the advice you need to get the most out of your marketing budget, but they offer the full range of printing services available and through working as part of an integrated marketing company, understand fully how the printed material fits into the bigger picture so we can make sure it dovetails into your range of marketing channels. We’re only a short journey from Burnley, Blackburn or Preston and have a number of account executives happy to visit you at your convenience who can supply advice and recommendations without any obligation on getting the most from print. Media Village is not just a print company, it doesn’t just supply printing services but we do have all of the capabilities of a print company and can deliver digital printing and litho printing with any of the print finishes to make your product stand out. deal with a commercial printing company who deliver far more than just print.